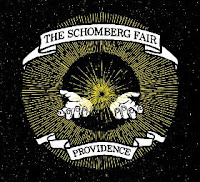 Toronto's The Schomberg Fair sure do roots rock differently than most. Unlike many roots bands, which tend to lean towards the boring folk side of things, The Schomberg Fair don't hold back on the stompin'. The trio are poised to release their new EP, Providence, on June 5th. It's another small sampling of their unique brand of hillbilly gospel. The banjo licks fly fast and furious as the group launches into the opening track "Touched By Fire". The drums pull the the forefront on "Paper Cranes", almost daring the rest of the band to keep up with the rollicking pace. "The Fire The Flood" slows it back down and adds an evil air that, quite frankly, gives me a wee bit of the willies. The atmosphere changes completely with "Don't Forget Me". The band drop the roots for a few minutes to grind out a noisy, feedback filled dose grunge, reminiscent of early '90s Toronto indie acts like hHead or Smoother. That sound is tempered by a down-home edge with the fiery closer "Black Cow River". You don't need to be a traditional fan of roots music to enjoy The Schomberg Fair. In fact, it might be best enjoyed by folks like me who are skeptical of the genre. The Schomberg Fair play Sneaky Dee's in Toronto on June 15th. Best tracks: "The Fire The Flood", "Black Crow River"